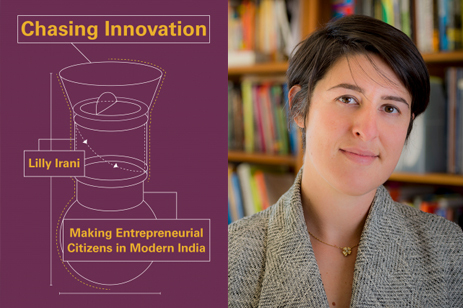 Congratulations to Dr. Lilly Irani on the publication of her book, Chasing Innovation Making Entrepreneurial Citizens in Modern India, by Princeton University Press. Over ten years in the making, this book explores how long-standing power hierarchies such as class, caste, language, and colonialism continue to shape opportunity in a world where good ideas supposedly rule all. Drawing on her own professional experience as a Silicon Valley designer and nearly a decade of fieldwork following a Delhi design studio, Irani vividly chronicles the practices and mindsets that hold up professional design as the answer to the challenges of a country of more than one billion people, most of whom are poor. While discussions of entrepreneurial citizenship promise that Indian children can grow up to lead a nation aspiring to uplift the poor, in reality, social, economic, and political structures constrain whose enterprise, which hopes, and which needs can be seen as worthy of investment. In the process, Irani warns, powerful investors, philanthropies, and companies exploit citizens’ social relations, empathy, and political hope in the quest to generate economic value. Irani argues that the move to recast social change as innovation, with innovators as heroes, frames others—craftspeople, workers, and activists—as of lower value, or even dangers to entrepreneurial forms of development. Dr. Irani’s research investigates the cultural politics of high-tech work practices with a focus on how actors produce “innovation” cultures. She is an ethnographer of work trained to analyze interactional, organizational, and cultural dynamics as mediated by technology. Dr. Irani also draws on her training as a Computer Scientist and designer to develop novel technical, organizational systems for contexts she studies, specializing in the cultural politics of high-tech work in the context of South Asian development, as well global AI economies. To learn more about Dr. Irani’s research, teaching, and background visit her faculty website or follow her on Twitter or Instagram.